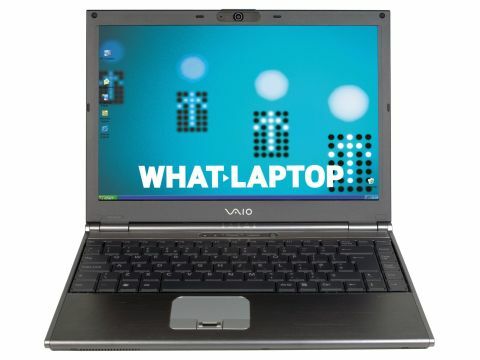 With dimensions of 315 x 228 x 37mm, the Sony VAIO VGNSZ1VP (£1531 ex. VAT) is pretty mobile. Slanting forwards, the front of the chassis measures a mere 24mm. Ideal for travel use, the Sony's 1.8kg weight marks it out as an ultraportable system. Maintaining mobility, the chassis is strong enough for life on the road. Only the 13.3-inch Super-TFT screen shows weakness due to an ultra-thin 7mm design. Image quality remains high, although the screen lacks brightness for ideal outdoor visibility. For comfortable use, the keyboard spans the width of the chassis. The keys are large, with a typing action that enables efficient touch-typing. Matching the screen, the touchpad is wide-aspect, and a fingerprint reader sits between the buttons for added security. Delivering power on the move is an Intel Core Duo T2500 processor. Backed by 1024MB of DDR2 memory, the Sony scored 238 points from MobileMark 2005 tests. This allows for outstanding business performance. For comprehensive storage, a 120GB hard drive and dual-format recordable DVD drive provide abundant space. For syncing data with external peripherals, a pair of card readers is fitted to either side of the chassis. Surprisingly, multimedia performance exceeds that of most business systems. Its dedicated nVidia GeForce Go 7400 graphics chip scored 4162 points from 3DMark 2003 tests, which means you'll be able to run multimedia applications with ease. To optimise battery life, a switch below the screen changes between the nVidia card and integrated Intel 945GM chip. Running for 236 minutes under nVidia power and 255 mins from the Intel chip, long-term usability is possible. Essential for peak connectivity, 802.11a/b/g Wi-Fi allows wireless access in the UK or abroad. When in the office, Gigabit Ethernet can be used for the fastest fixed data transfer speeds. Connectivity is enhanced by the use of a 1.3-megapixel camera located above the screen. Perfect for using instant messaging services and video conferencing with colleagues, users can stay in touch with meetings even when out and about.